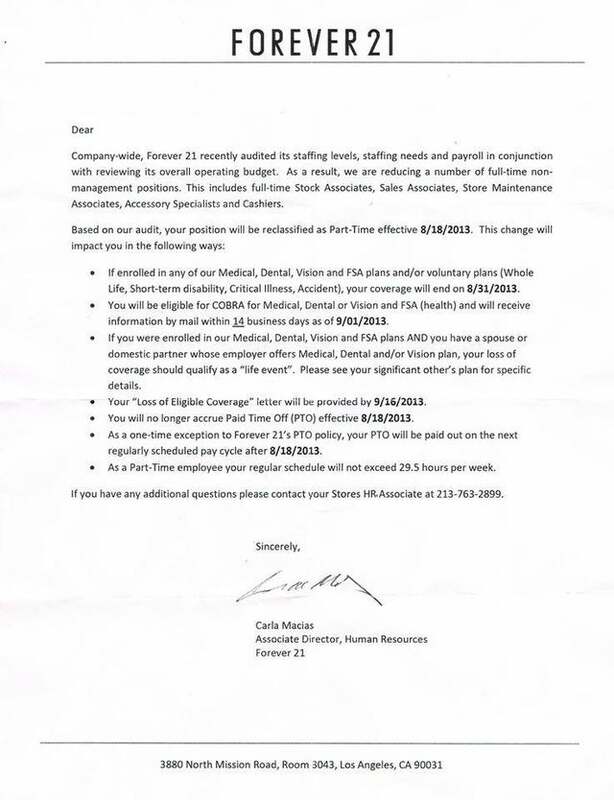 In the latest controversy for mass retailer Forever 21, an (understandably) disgruntled employee has leaked an official letter announcing cuts to benefits and hours for some of the company's employees. Jezebel points out that this may be a response to the Affordable Care Act, which has put many companies into a similar situation, though the company has stated that is not the reason for these changes. Right now, the Forever 21 Facebook page is full of comments complaining about the letter, from employees and customers alike. Though so far, the company has only provided a generic response saying the cuts will affect less than 1% of all American Forever 21 employees and is the result of an effort that "realigned its staffing needs to better reflect sales expectations." The company has previously come under fire by the U.S. Department of Labor for issues with overtime-wage laws.